Patricia M. "Pat" Routsong, 91, of Sandusky, passed away peacefully late Wednesday morning, November 28, 2018, surrounded by her family in the Stein Hospice Care Center, Sandusky. Born on September 6, 1927, in Chicago, IL the daughter of Raymond Francis and Dorothy Mildred (Chute) Hanlon. She had worked for the family business, the Erie County Credit Bureau, for nearly 25 years, before retiring. 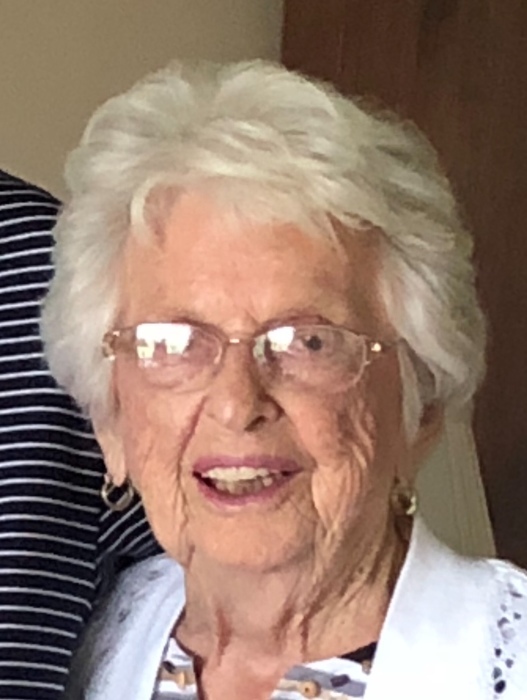 Over the years, Pat was involved with the Beta Sigma Phi Sorority, played cards in Bridge Clubs, bowled in the couples leagues, with her late husband, in the Elks Bowling League and later had played golf in the local area golf leagues. Pat was most proud of being active with the "Clothe a Child" program (later known as "Coats for Kids) for several years as a member on the Board of Directors for the Volunteer Center. She was a member of Sts. Peter and Paul Catholic Church. Pat is survived by her family; Bill (Pat) Routsong of Sandusky, Robin (Joe) Thurm of Exton, PA, Chris (Judy) Routsong of Milan, Julie Trautman of Milan and David Routsong of Sandusky; ten grandchildren and nine great-grandchildren; a brother, Robert (Jane) Hanlon of Columbus, OH; and several nieces. She was preceded in death by her parents; her husband, Donald F. Routsong (December 2, 1970); 2 brothers, Raymond and Edward Hanlon; and a nephew, Tom Hanlon. The family will receive friends on Friday morning, November 30, 2018, from 9 am until time of the Mass of Christian Burial at 10 am at Sts. Peter and Paul Catholic Church, 510 Columbus Avenue, Sandusky. Fr. Jeff Walker officiating. It was Pat's wish to be cremated following the service. Burial will be held at a later date in Calvary Cemetery, Sandusky. The family suggests that memorial contributions be made in her memory to Stein Hospice Service, Inc., 1200 Sycamore Line, Sandusky, OH 44870. Arrangements are entrusted to the David F. Koch Funeral and Cremation Services, 520 Columbus Avenue, Sandusky. Your memories and words of comfort may be shared with Pat's family at davidfkoch.com.